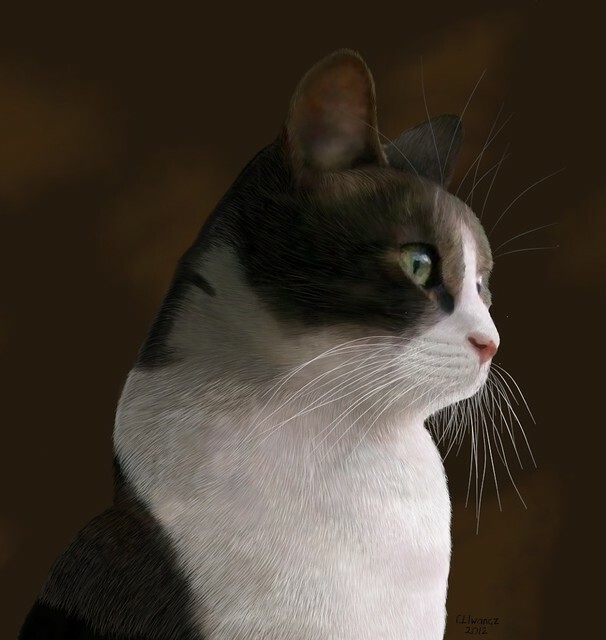 A portrait of one of my daughters cat's. I may leave it at the head and shoulders but may continue and do the full body. Millet is a beautiful cat. And once again you fur brush work is excallent! And I love her eye. really just exceptional. masterful. thank you for taking the time to make such a beautiful painting. I think the best art I have ever seen come off an ipad for sure. The detail is just amazing and that eye is so beautifully done I can see the liquid on the surface of the eye. what a beauty. Thank you all so much for your wonderful comments, they are much appreciated, Milly is a beautiful Cat and I loved doing it. I still have my daughters other cat to do now, that is going to be a challenge Ashley is all Black. I have nearly finished another painting of a mink, I just need to get the background done. Very beautifully done indeed, looks photographically realistic. I admire your precision and deft brushstrokes - which tools did you use? and I imagine it must have taken masses of time to complete? Thank you Rowena, I used the pen tool with full taper the size of the pen ranging from 1 to 3%.